A pair of colorful men's socks is a great way to spice up a gentleman's closet. Colorful socks can add interest to casual outfits, or even dress down a more formal look when out on the town. Patterns are available for every man, regardless of his passions and dislikes. Sock Dreams- Colorful men's socks never looked as good as the ones available from Sock Dreams, which are unique and vibrant. Many different outfits will benefit from the splash of color provided by the products from Sock Dreams. Designs include a yellow, purple, black and teal sock inspired by the ones the Joker famously sported in The Dark Knight. Seasonal orange and brown striped socks will look great with earth tones, while novelty socks such as those made to look like a sheet of notebook paper or a yellow #2 pencil add a bit of fun to any pair of slacks. Happy Socks offers fashion socks in unisex styles. Made from combed cotton, all the socks on this site have a flare that is rare to find in men's socks. Whether you prefer polka dot, five color, striped or two tone, Happy Socks' collection of over 100 sock styles is sure to have everything to fit your tastes. All socks are delivered to the US within five to twelve days of order, and are machine washable so you can wear and wash them regularly without worrying about your bright colors fading. Under Armour- Great men's socks need not be confined to home or the workplace. On the soccer field, gridiron, or baseball diamond, Under Armour has sports covered with a selection of socks in nearly any color available. These performance socks can be matched to a team uniform of any combination of colors. However, the Under Armour brand of socks has more to offer than a great color selection-they are formidable, and will stand up to the rigors of hard training and intense games. The compression and moisture wicking material of Under Armour makes these colorful men's socks a superior choice for the active gentleman. MLB Team Socks - If you want to show everyone that you're a fan from your head to your toes, try purchasing a pair of colorful MLB team socks. Every Major League baseball team is represented on the Absolute Socks website, listed alphabetically by team name. These socks bear the logo of the team around the neck, while the heel and toe match the team's colors. The team name is written on the side of the foot. Best of all, Absolute Socks has a very low shipping fee, meaning you can represent your favorite team for less. 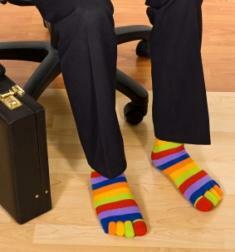 When wearing colorful socks, try to coordinate them with your outfit. A touch of color, especially if it picks up the color in your shirt, in a tie, or even in a baseball cap depending on the occasion, can really complete an outfit. Just make sure your socks don't clash and that the colors are aesthetically pleasing.